These images are copyright protected by Debbie Jones © 2019. All rights reserved. Please do not use these images without permission. 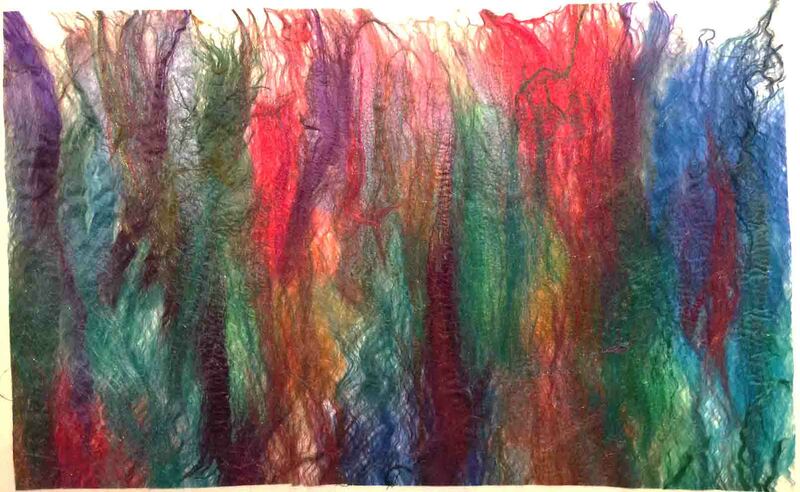 used in "Winding Pathways", below..
"Winding Pathways" art quilt, 12"x20" (20"x20" including the threads hanging below the quilt). Silk Fusion laid over a red background fabric, with decorative yarns and threads stitched and couched down with quilting. There is no free-motion quilting on this piece, just used a walking foot and decorative stitches. 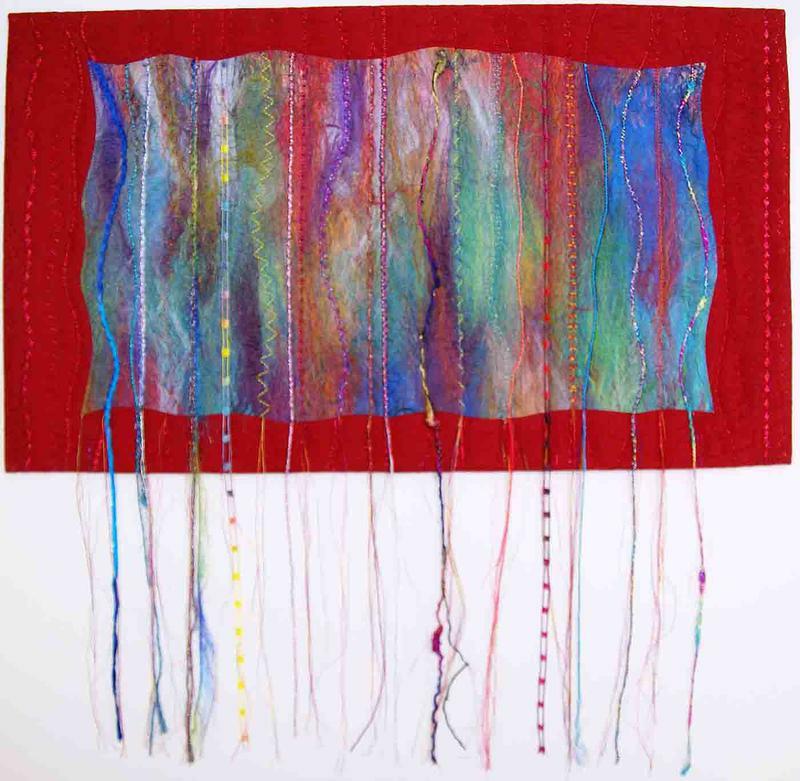 and the idea for leaving loose threads hanging was inspired by the art quilts of Renee Brainard Gentz. 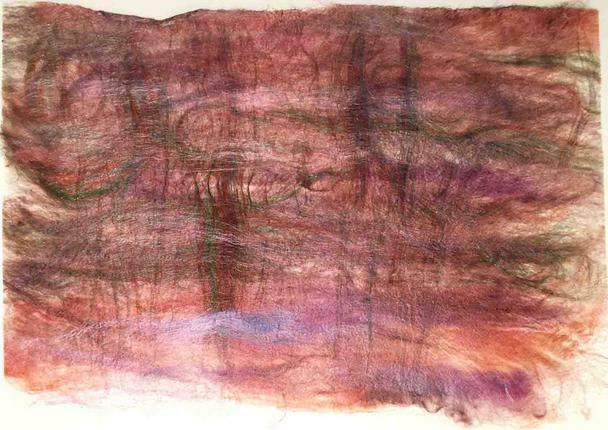 Silk Fusion "fabric" laid over a beige background, used in "Dragonfly Dance", below. 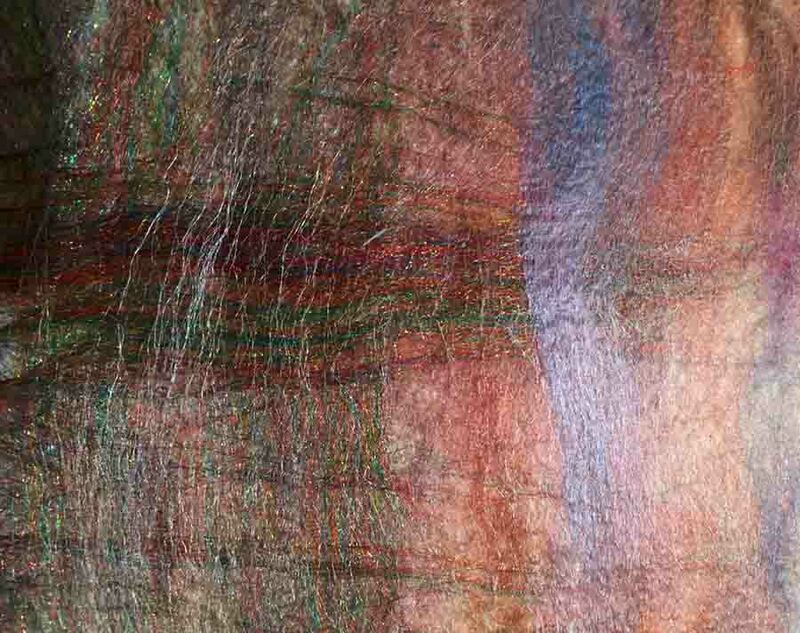 Close-up of the Silk Fusion "fabric" pictured on the left. 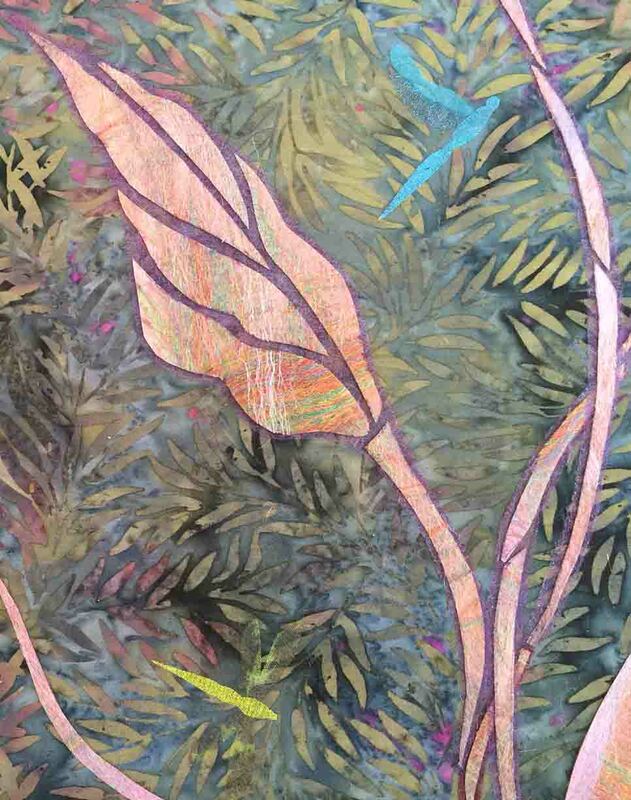 "Dragonfly Dance", work in progress, to be quilted, 24"x18". and the edges of the sheer fabric were trimmed to just barely outline the outer edges of the big leaves. This made the leaves stand out from the background nicely. 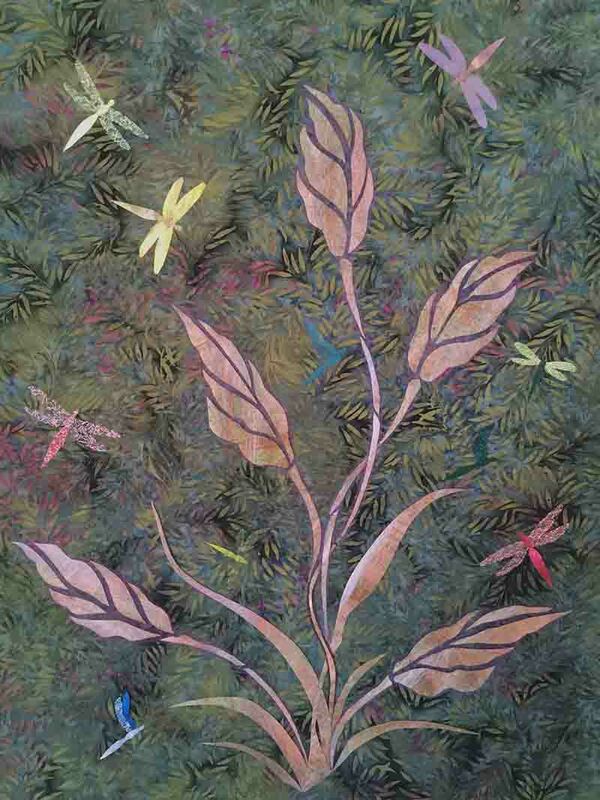 to make each dragonfly using sheer and metallic fabrics as described in the pattern. I am not finished with this design yet; for one thing, the blue dragonfly at the bottom left is distracting. Maybe a gold one instead? We'll see. The finished piece will be quilted, and I'll post a photo when it's done. Another close-up of "Dragonfly Dance". 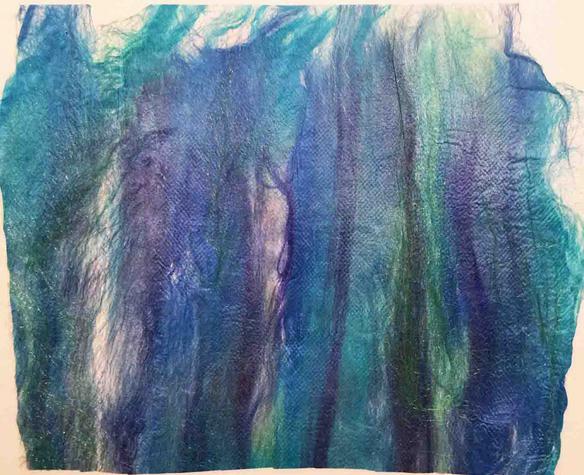 Silk Fusion "fabric" laid over a beige background, used in "Sea Dreams", below. 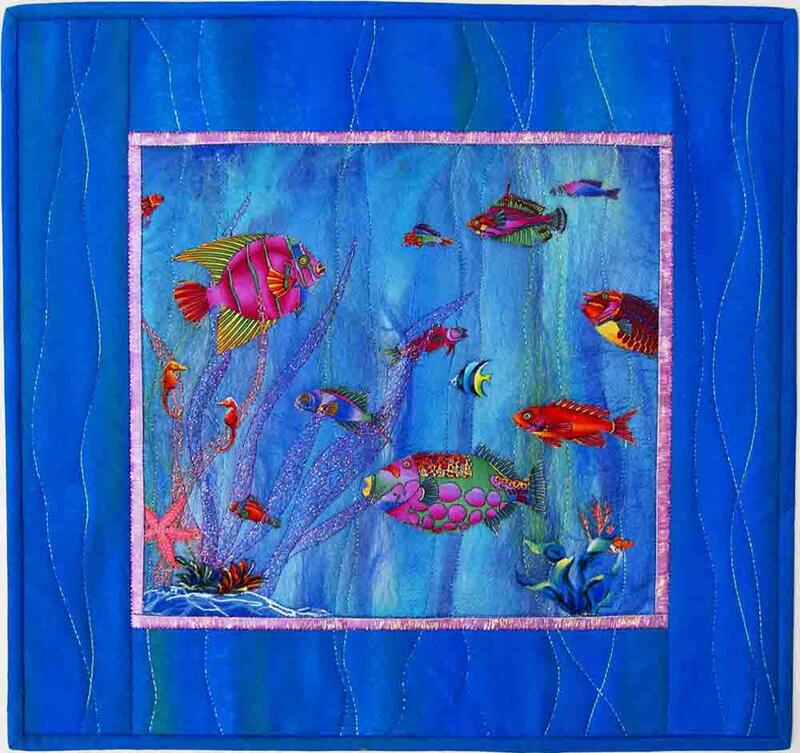 "Sea Dreams" art quilt, 14-3/4"x15-3/4". 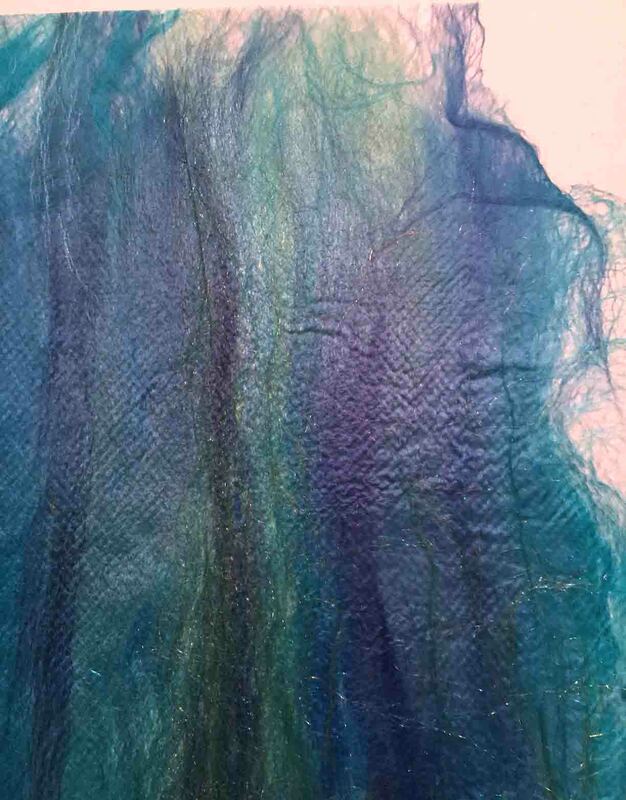 Silk Fusion was bonded to a blue fabric background, then fish and sea plants were fused onto the Silk Fusion. then a hand-painted fabric in shades of blue was added for the outer border. 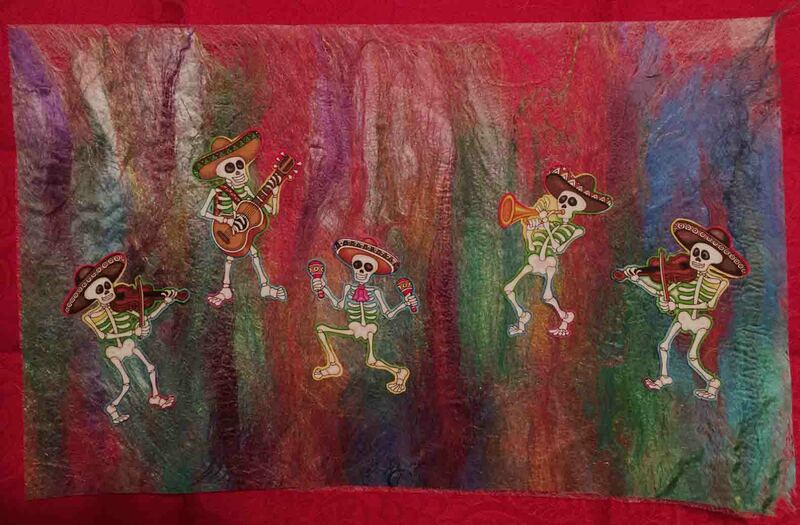 Quilted with clear, rayon and metallic threads, bound with same hand-painted fabric as the outer border. this is because the Silk Fusion is translucent in places, and the blue background fabric that was fused behind it really showed through. 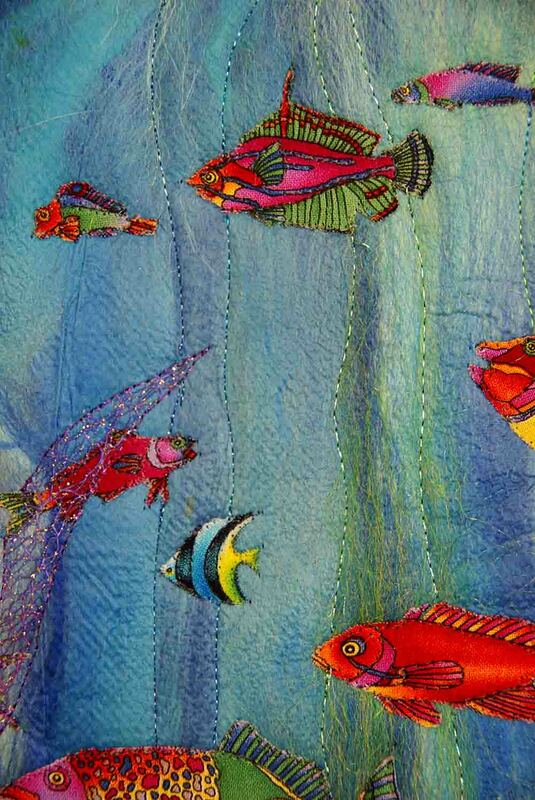 Clear thread was used to stitch down the edges of all the fish, then rayon and metallic fabrics were used to outline the kelp and to add wavy lines through the water, extending into the outer blue border. 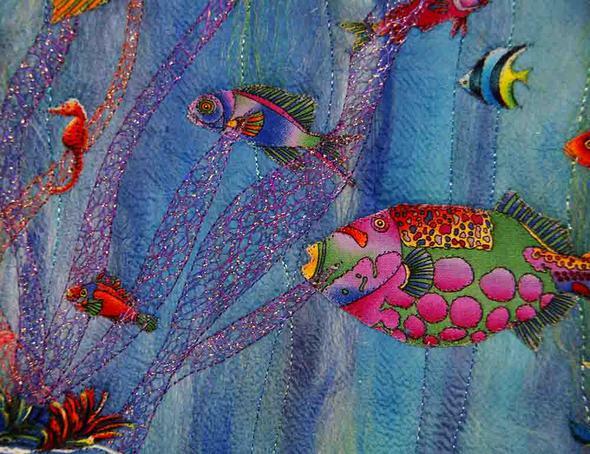 Another close-up of "Sea Dreams". 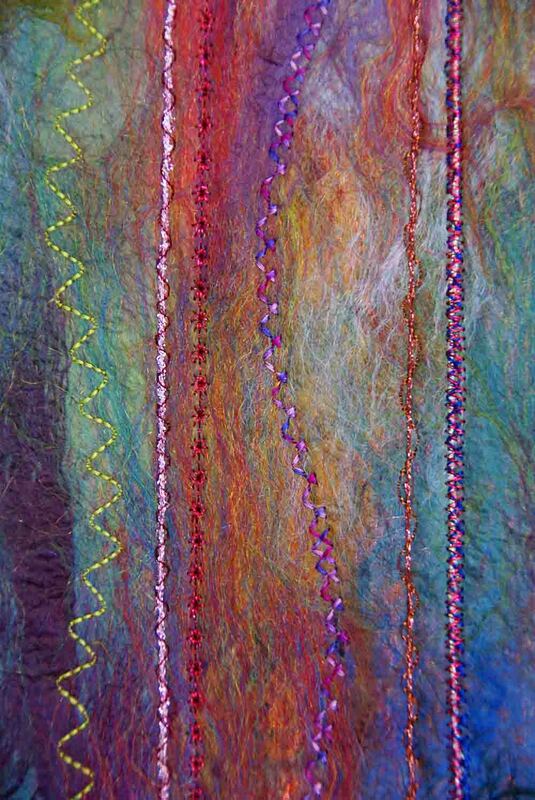 Close-up of the stitching on "Winding Pathways", pictured on the left. all rights reserved. Please do not use these images in any way without Debbie's written permission. 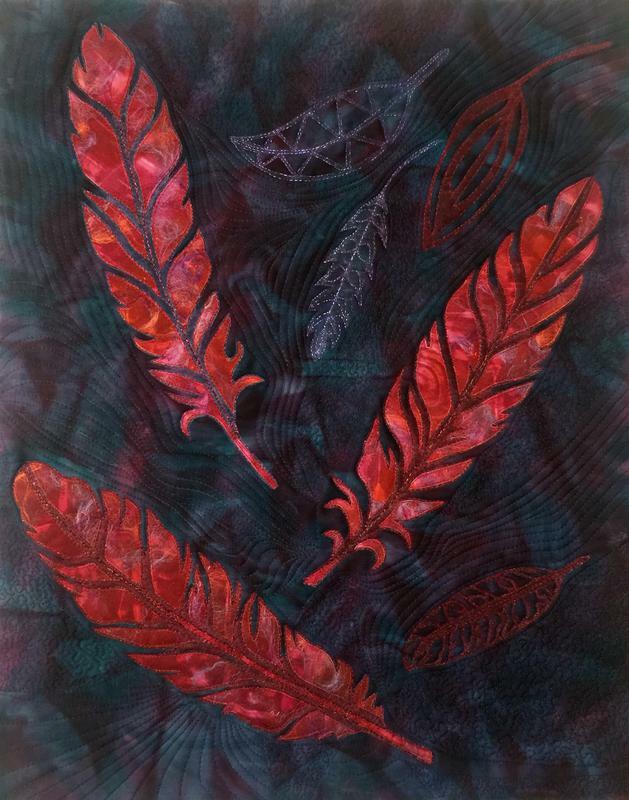 The feathers in this piece are Silk Fusion that was bonded to a red hand-painted silk-cotton fabric. Then stencils were used to trace and cut out the feathers. Smaller feathers were cut from sheer fabrics. 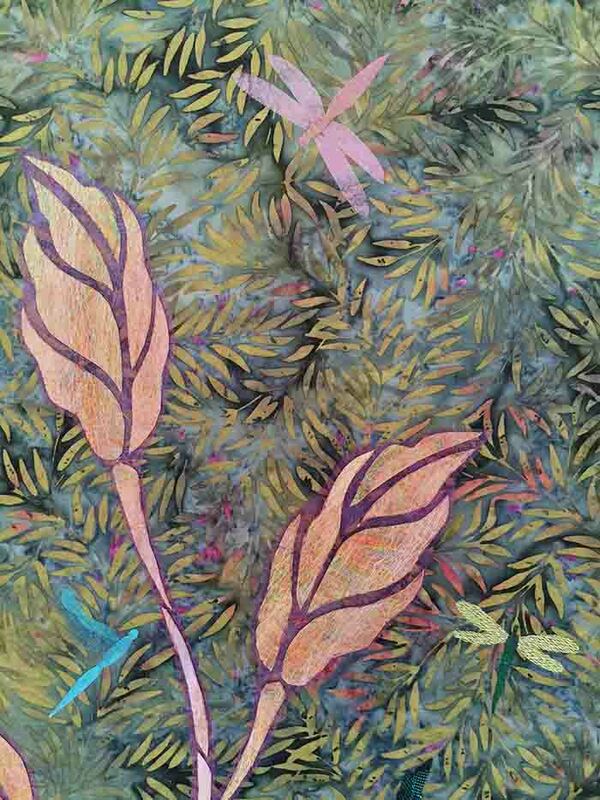 All feathers were fused to a teal and purple hand-painted silk background fabric, then it was free-motion quilted using metallic and rayon threads. The quilt was finished with a facing, rather than using a binding.